Who would have known that I'd end up at the ER on Wednesday? I guess there's always a first for everything, and this was my first ER adventure. My trip to the ER was more of a precautionary move, as I lost consciousness again at the train station on Tuesday evening. I hate fainting because it feels like dying especially when everything turns black and then you drop like a leaf. After fainting at the train station, I still managed to drive myself home. It was Wednesday morning when I had the chance to report what happened to my hematologist, and so he insisted I check in to the nearest ER just to make sure there's nothing else going on. And so I spent almost the whole day at the George Washington (GW) Hospital, hooked to an IV and under observation. Apparently, my platelets went down to 35 coupled with dehydration. The doctors and nurses who looked after me were so nice. Thank you, GW! 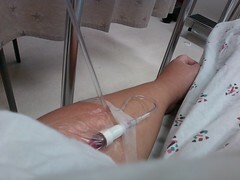 IVs are not my favorite. Since yesterday, my office insisted that I stay at home and recuperate the rest of the work week. So here I am, at home and resting. In an hour or so, I'm heading to see my hematologist for more tests. I guess my day is just getting exciting. OMG! when i read "ER" i kind of went "what!? why!?" stay safe kayni...health is the top priority ;) take care! get well soon.It's scarry to faint and even to drive after. Thanks for the blog visit, I meant to drop by here and pass on that 'versatile blogger' award..
take care. don't let the hustle and bustle of the holiday season takes its toll on you. hi Kayni! read this one just now. alex and i were out almost the whole day yesterday..
ay grabe kayni! i've never fainted in my whole life, so i can just imagine the horror! take care kayni! don't stress yourself too much! you call it adventure. i like your attitude about it, Kayni. :) magpagaling ka.. I admire you for your great calm. You know the drill because you're a strong person and looking at 'it' as positively as you can. get well soon kayni. i hate seeing that IV on anyone. i am reminded of the time EJ was in hospital.. The way you narrated it sounds like it was an adventure. Great attitude! Seriously, take much care. I hope it's manageable. you sure have lots of courage, don't you? =) After fainting, you still drove yourself home. I fainted only once in my life, and yeah, the sudden darkness somewhat feels like dying.